Usually, it's pretty hard to analyze information from the squid log file. 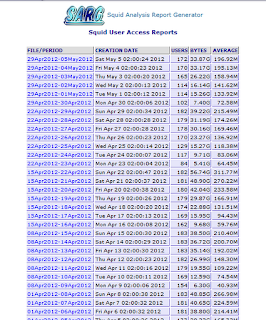 For example, I don't know how to analyze date or number of hits from /var/log/squid/access.log. If someone needs to analyze which websites are being accessed from the network, SARG may be a very good tool. SARG, or Squid Analysis Report Generator (http://sarg.sourceforge.net) analyzes the log, and generates a web based table where one can easily analyze proxy traffic. Although SARG can be installed using YUM, I have faced problems with CentOS 6. So, I went for tarball installation instead. And believe, it's really easy unlike many tarball installtions. There are a lot of options, and it is always recommended to go through them. However, we'll be editing only the ones that we need. Now, we'd be adding a scheduled task to run SARG at 02:30 everyday. Check if there is a file /etc/httpd/conf.d/sarg.conf. There is a line "allow from". Modify it to suit your needs. Verify that there is directory "/var/www/html/squid-reports"
If you receive this message from your Zimbra server, then it is likely that an encrypted PDF or ZIP has been quarantined simply because the Zimbra virus scanner could not examine the contents of the file. This feature can be disabled, so that encrypted archives will pass the virus scanner. However, this does not mean that you are now vulnerable to viruses. Since the virus scanner has a database of signatures for viruses and malware, so should still be able to catch real security threats. To disable the blocking of encrypted archives by Zimbra anti-virus scanner, perform these steps in the Zimbra Web Admin console.